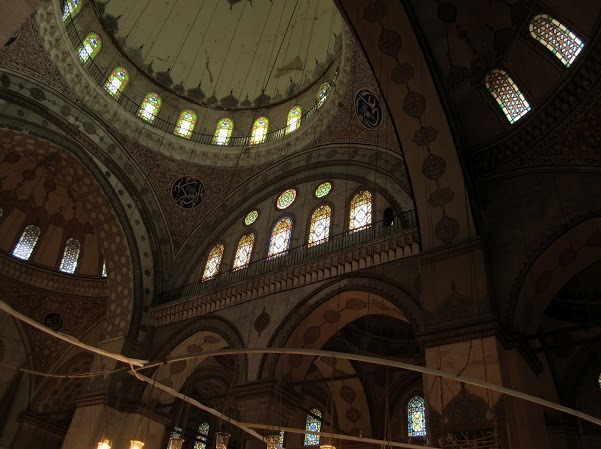 Now, at first, I was going to just include a bit about the Grand Bazaar in my general post on Istanbul, but I realized that it was such a highlight of the trip for me, that it deserved its own post. 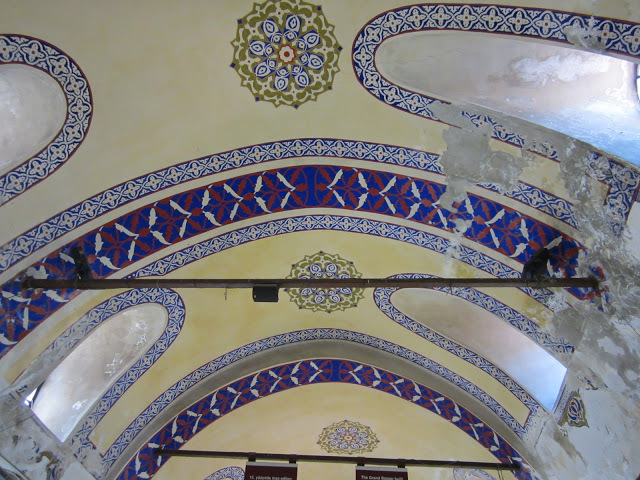 So here we are, lets talk about the Grand Bazaar!!! 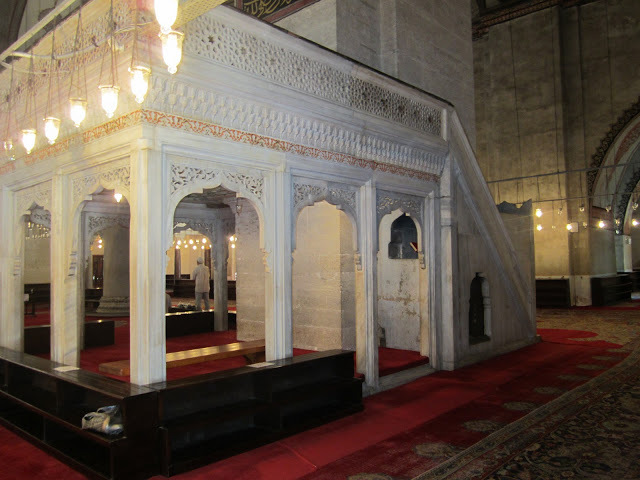 I’m also including the Sultan Bayezid II mosque in this post, because it is adjacent to the Grand Bazaar and we visited the Mosque right after the Bazaar. 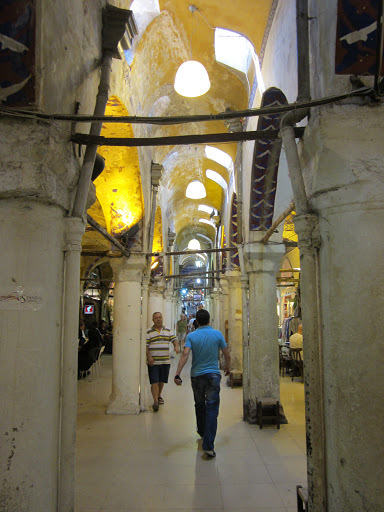 The Grand Bazaar is one of the oldest markets in the world. 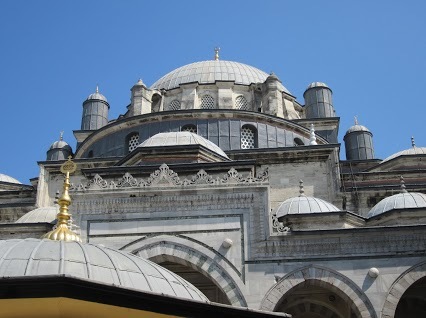 It is made up of something like 61 covered streets, and is home to over 3,000 shops. You can find anything here, if you can figure your way around!! We just wandered through the maze, making rights and lefts whenever we felt like it. I got to wondering how the shop-keepers even find their own shops in this maze! Maybe they use a map like the one above. 🙂 The highlights, for me, are the lights, teas and spices…. the stuff that’s harder to find at home. 1400’s. 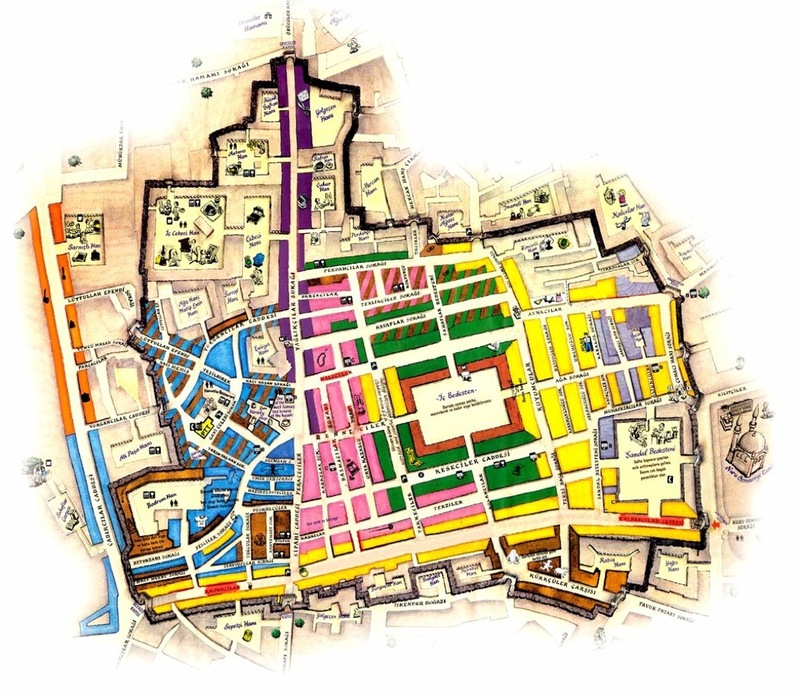 Construction continued in the 1500s and into the 1600s as the site expanded, evolved and developed from a place originally designed to trade textiles into a marketplace for luxury goods, until it finally took its final shape in the 1700s. According to some sources, the site remained unrivaled among markets in Europe with regards to the abundance, variety and quality of the goods on sale into the 19th Century. 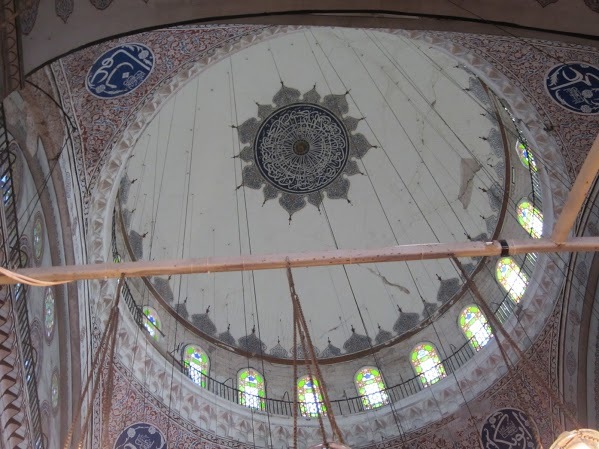 Despite falling victim to many fires, natural disasters, and other calamities throughout the years, the Grand Bazaar has undergone some repairs, and remains a vibrant marketplace and much-frequented landmark. It is also a large source of revenue and employment, and as of 2012 some 26,000 plus people were said to be working there. 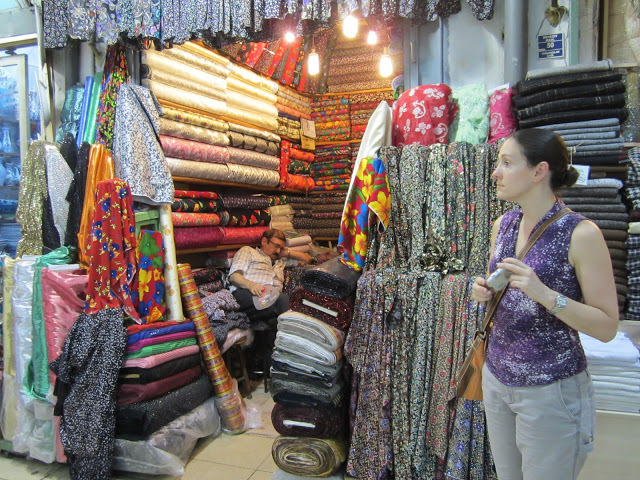 Fabric store vendor, asleep in his stall – probably tired from trying to find his shop in the maze of the Bazaar!! 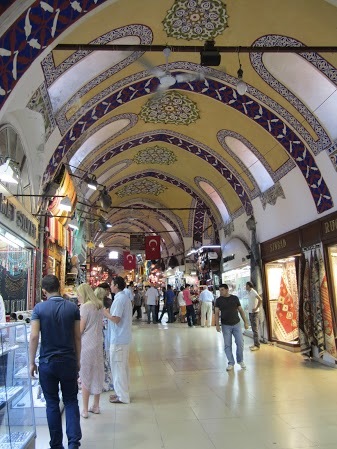 Nowadays, the shops that line the halls and streets of the Grand Bazaar carry a colorful array of goods. 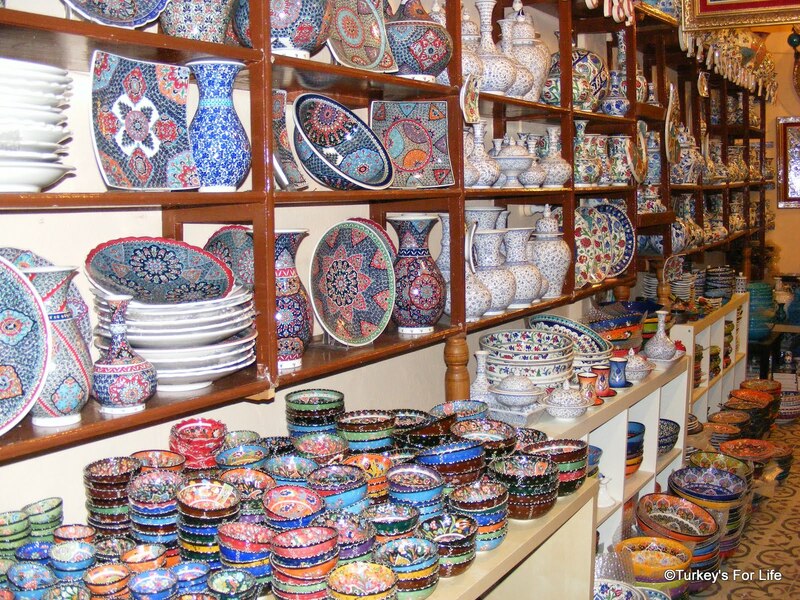 You can find all kinds of souvenirs, from Turkish Ceramics (which I fell in love with! 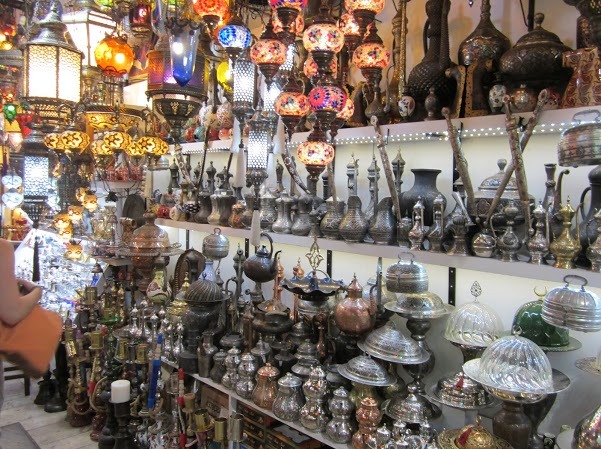 ), to mosaic lamps, hookah pipes and tobacco shops, carpets and fabrics, clothing, shoes, and an endless array of spices and teas. As we wandered and talked to shop-keepers about the goods they were selling, we learned more about Turkish traditions, and goods. For example, the man who sold me my beautiful hookah pipe and a few flavored tobaccos to go along with it took his time to explain some of the different designs, which ones are more traditional, and the features of some of the different models. It didn’t feel like a rushed transaction, so that he could hurry on to the next customer, which surprised me, for a shop in an area that attracts so many tourists. 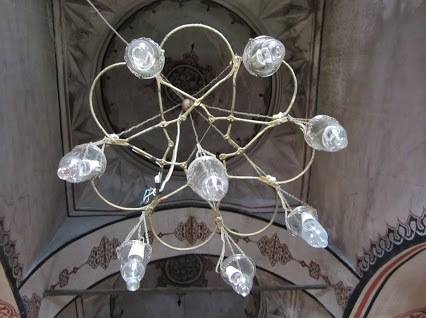 Here are some of the goods to be found in the Grand Bazaar. It seems the Turks like their aphrodisiacs!! I liked this sign – I know they meant the dessert ‘Turkish Delight’, but the play on words amused me! Selection of teas – I like the Jasmine Tea flowering balls, myself. 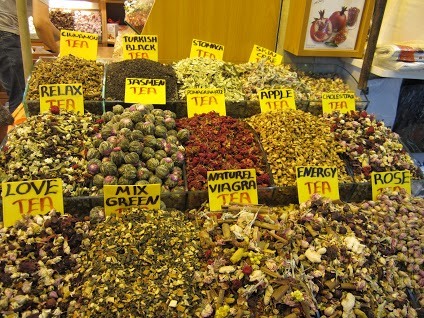 And note there are more aphrodisiacs here – “love tea” and “natural Viagra”…. I can’t vouch for those, I didn’t get any of that!! Yet another aphrodisiac item – with a picture to make its purpose clear!! 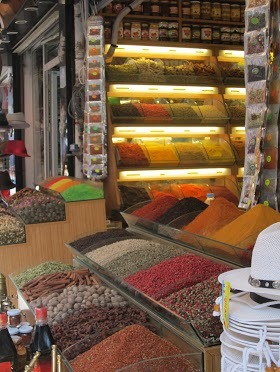 One thing that I found entertaining was the amount of “love” or “aphrodisiac” items that we came across in the spice section of the Bazaar. 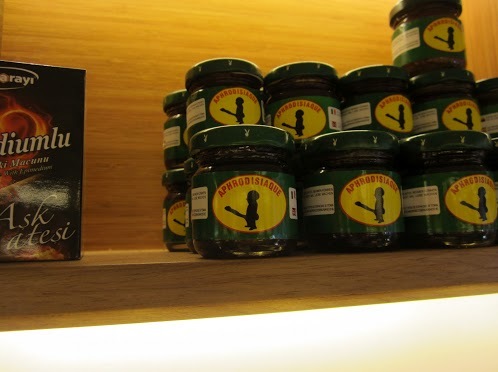 From “Turkish Viagra” to “Love Tea” to “Natural Viagra” to some kind of honey that had been infused with aphrodisiacs (with a suggestive label – pictured here), the Turks seem to like their sexual aids – or at least think that tourists want to buy them!! 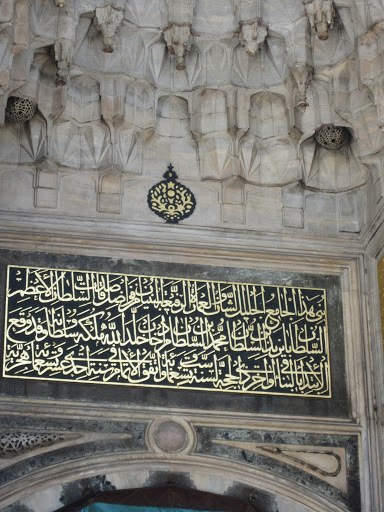 We had many a giggling shop keeper suggest that A or I should buy some (“perhaps for a friend …. hee hee hee”) – offers that we politely declined, though we did get some good laughs out of it all!! In the end, by the time we left Istanbul, I was the proud owner of some ceramic trivets, a quartz tile, a lovely ceramic plate, a hookah pipe, a traditional dress (I believe from a region in the north) and some jasmine tea balls that are very fragrant and make wonderful tea. All in all, good shopping accomplished!! 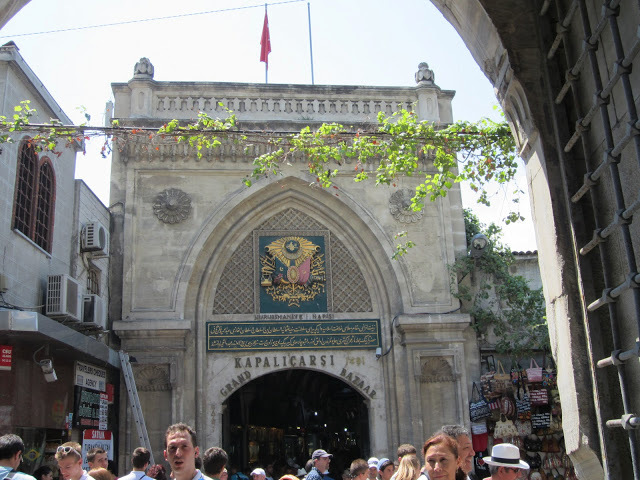 After we finished up at the Grand Bazaar, we started to make our way towards an exit, so that we could get our bearings and find our way back to our hotel. 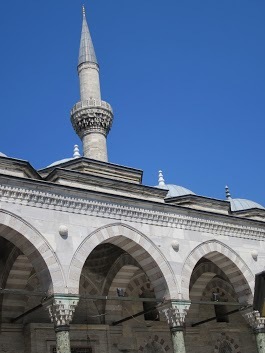 We headed towards the street and came across the Sultan Bayezid II Mosque on our way. 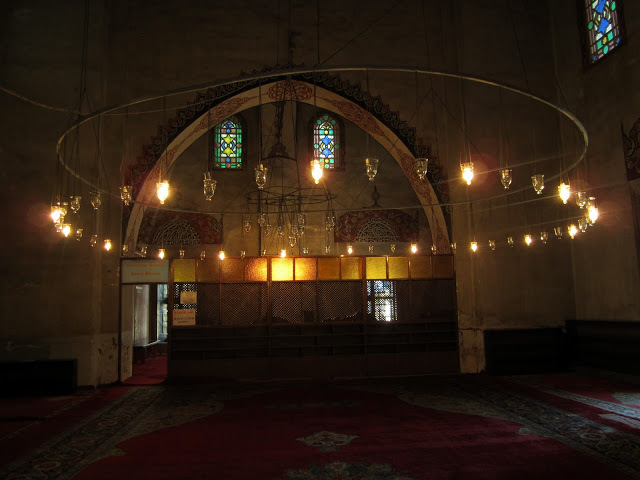 Despite having been to several Islamic countries before this, I had never been inside a Mosque, as in many places, they are not open to non-Muslims or tourists. 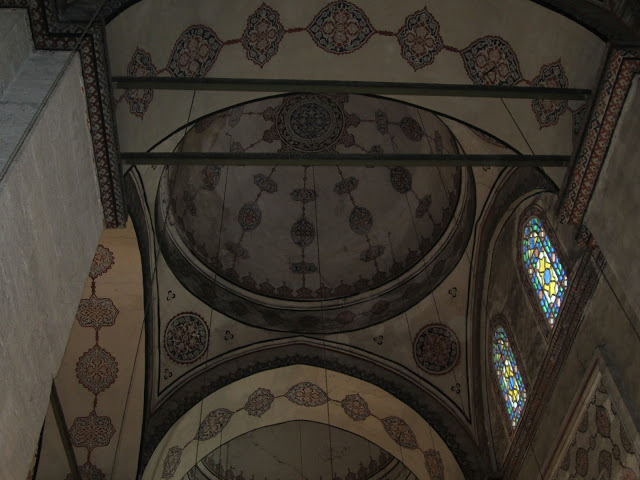 But this Mosque was open for tourists, and we were even allowed to take photographs inside it. The conditions of entry are that women must cover up and you must remove your shoes. 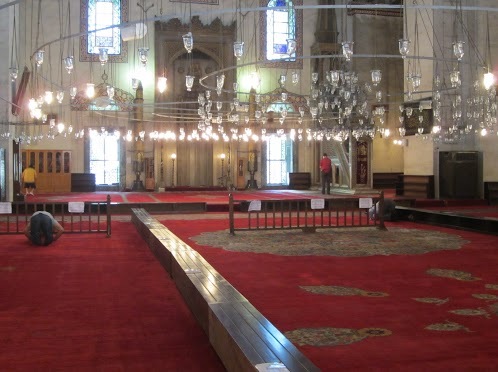 I make sure to bring an airy cotton shawl with me when I travel in Muslim countries, so that I can always have something to cover my hair and/or shoulders when appropriate, but for those who did not come prepared there are shawls available at the entry to the Mosque. First, though, you walk into the courtyard, where you can admire the carved facade of the building, and the beautiful design. The complex was built in the 1500s, and since gone through some repairs, but the beauty and history surrounds you as soon as you enter. 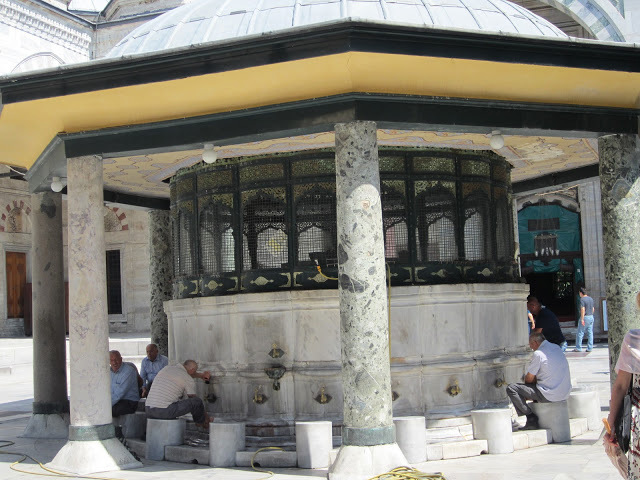 There is a structure with founts of water, so that Muslims coming to pray can wash their hands and feet before entering the Mosque. 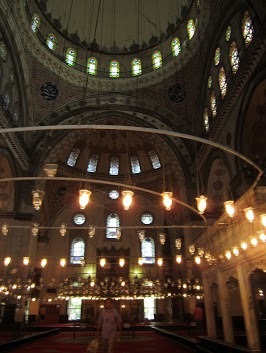 After walking through the courtyard and removing our shoes, A & I covered our heads and entered the Mosque. That’s all for this post! Next up? Ephesus!! I as well think this s a very good website.